Munnar -The so called "tea garden hill station of kerala". On the way visit vallara and cheeyappara waterfalls and Blossom Garden. Evening, enjoy the beauty of tea garden. Overnight stay at the hotel. Today After breakfast , Sightseeing of Munnar. Visit Eravikulam National Park (15 km) to view endangered wild goat ' Nilgiri Tahr'. (National Park is Closed during breeding season. Please check with us regarding the visit prior to your arrival). Visit Tea Museum (03Km) and the Tea factory (Closed on Mondays and Good Friday) , Mattupetty Dam (13km) and Kundala Lake (28km).Overnight stay at the hotel. Thekkady is a pleasant heaven on earth for those who love nature in its wild manifestations. Spices are found in abundance in Periyar. Get ready for a spice tour to view the plantations of a wide variety of spices like cardamom, pepper, tea, coffee, cloves, ginger, turmeric, cumin seed, etc. Overnight stay at the hotel. The "Venice of India" noted for its winding waterways and canals. It is an important commercial and business town, manufacturing and exporting coir products and black pepper. 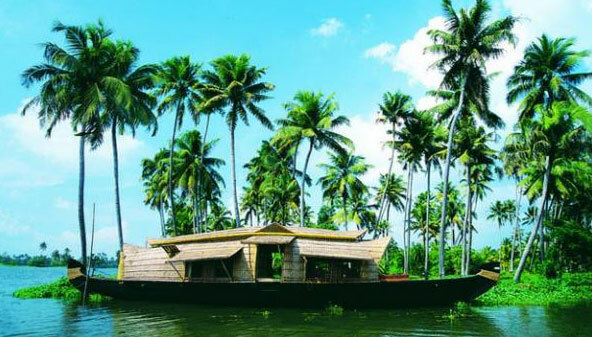 Explore the natural beauty of Kerala, the paddy fields, narrow canals, coir villages etc. Overnight stay at the hotel/ House boat. Transfer to Airport / Railway station. Back to home with sweet memories of your tour. Destinations Covered : Kochi, Kovalam, Thekkady, Thiruvananthap..
All Rights Reserved. Glacier Holidays Pvt. Ltd.